Spring is finally here–happy first day of Spring everyone! I love it when I can whip up a sweet treat that only takes a few minutes and has a few ingredients…. and most importantly is super cute like these pops! 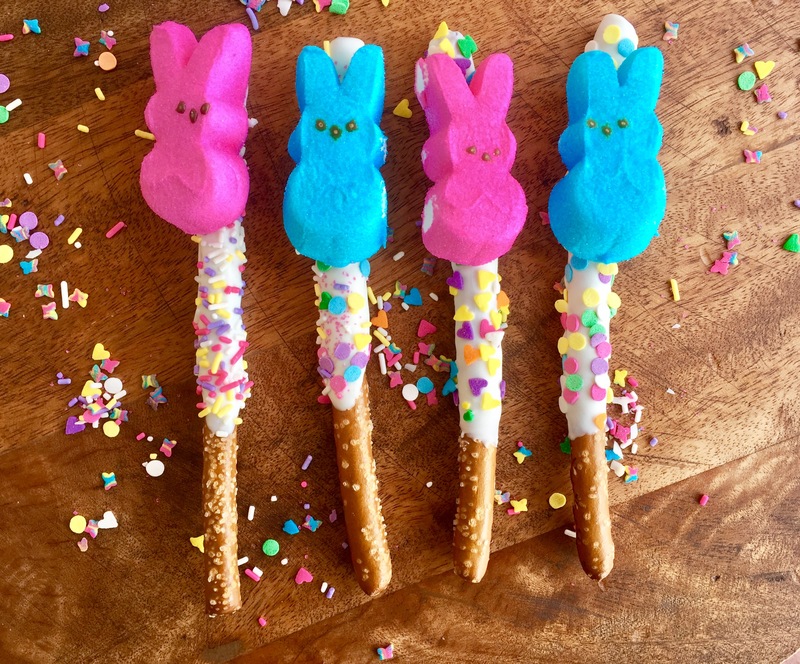 These cute Easter bunnies are so adorable and so easy to make! They are also fun to make because you can make them however you want! 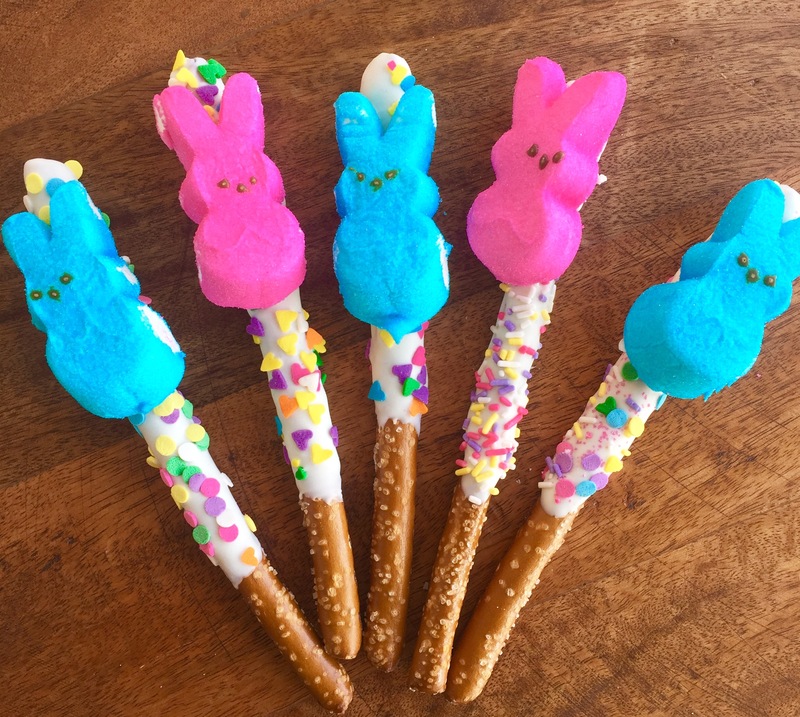 I love marshmallows so I love when I see Peeps displayed at grocery stores this time of year. I feel like Peeps are only around for such a short amount of time and they don’t get used as much as they should. Kids will love this recipe, I know my 2 year old Goddaughter did! When I gave her a treat bag full of these, she was so happy to see this colorful treat and the first thing she ate was the Peep, of course! 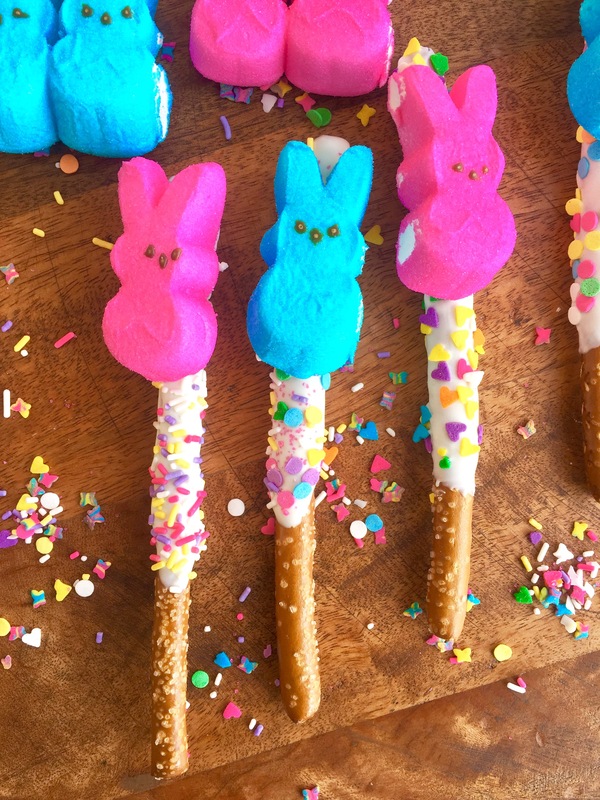 These treats are so adorable and will put a smile on anyone! Melt chocolate in microwave for 1 ½ minutes, stirring every 30 seconds until melted and smooth. Pour melted chocolate in a drinking glass or mug. Dip and or spoon each rod to cover about ½ the pretzel in the chocolate. Scrape excess chocolate off on edge of the cup. Smooth out chocolate with a spoon or knife so it is dipped evenly and smoothly on the rod. Sprinkle each rod with your favorite sprinkles and place on baking sheet. Spoon about a ½ tsp. of melted chocolate on the back of a peep and position on rod to set. Repeat until finished! Let each rod set for about 15 minutes, you can also place them in the refrigerator to cool and harden faster. 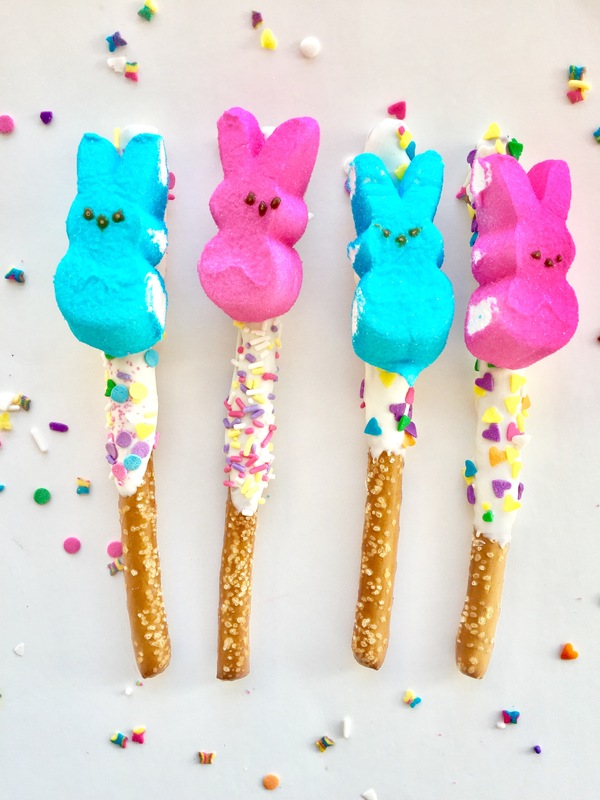 Enjoy these adorable sweet treats! There is just something about Peeps that makes me happy, maybe because they are so cute! Does anyone else feel that every Holiday comes and goes too fast? I always feel so rushed to enjoy all the festive treats that come once a year, so I might as well make them when I can! Who doesn’t love a cute and delicious sweet treat anyways?